First stage of the „Highlights of Via Dinarica“ program serial is a perfect introduction to the world of Dinarics…We hike along Velebit mountain, the heart of the Crotian Dinarics and enjoy the Adriatic coast, from up above the mountain and down from the shore…We visit the historical towns of Zagreb and Trogir (UNESCO), taste local food and learn about wildlife, cultural heritage and traditions. Arrival to Zagreb airport and transfer to our hotel. Free time (if flight arrival time allows) spent exploring this medieval gem of the continental Croatia, dating back to 11th century. Dinner in the Old Town and overnight. Morning transfer to one of the most amazing natural spots in all of Croatia, National Park Plitvice Lakes. 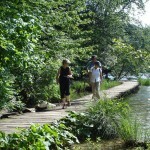 Visit of the park, hiking along the Upper and Lower Lakes of this stunning site, situated in UNESCO world heritage list. We learn about the geological processes that have created a network of lakes and waterfalls around us. Plitvice lakes are also a heart of the conceptual „Green Line“ of the Via Dinarica trail – a region of Dinarics pushed further into the continent, characterized by rich forrests and a lot of natural streams, rivers and lakes. After Plitvice, the Green Line of Via Dinarica moves into the National Park of River Una (Bosnia) and continues further east towards Tara river in Montenegro, home of one of world’s deepest canyons (see Via Dinarica Bosnia to Montenegro program). After exploring the Plitvice lakes, we take a transfer to Krasno Polje, a small village underneath Velebit, the greatest Croatian mountain and the heart of Via Dinarica Croatia. Dinner and overnight in a local family pansion. Today we embark on our Velebit multiday hiking adventure. 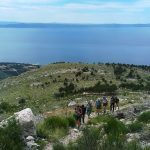 The hike takes us through mixed decidous and evergreen forrests, ascending step by step to the main ridge of Velebit mountain. 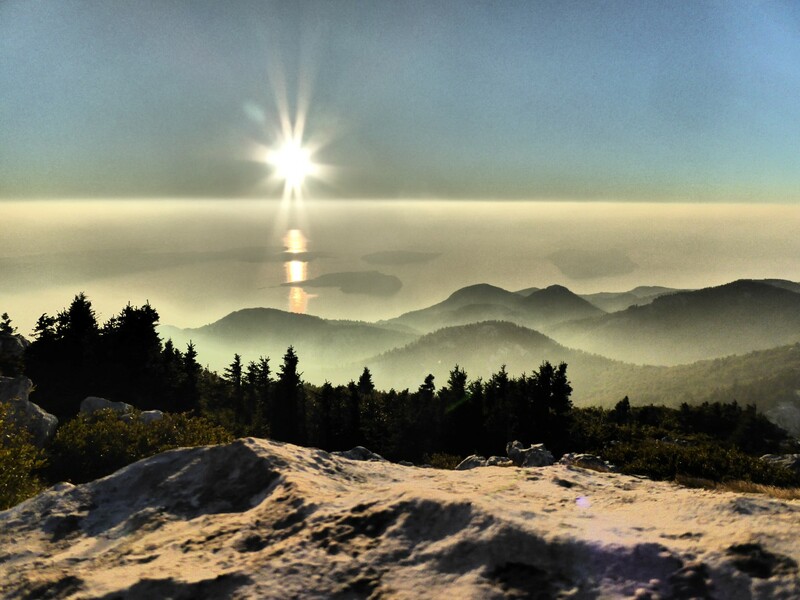 It is said that what Olymp is to Greeks and Triglav to Slovenians, that’s what Velebit is to Croatian people. 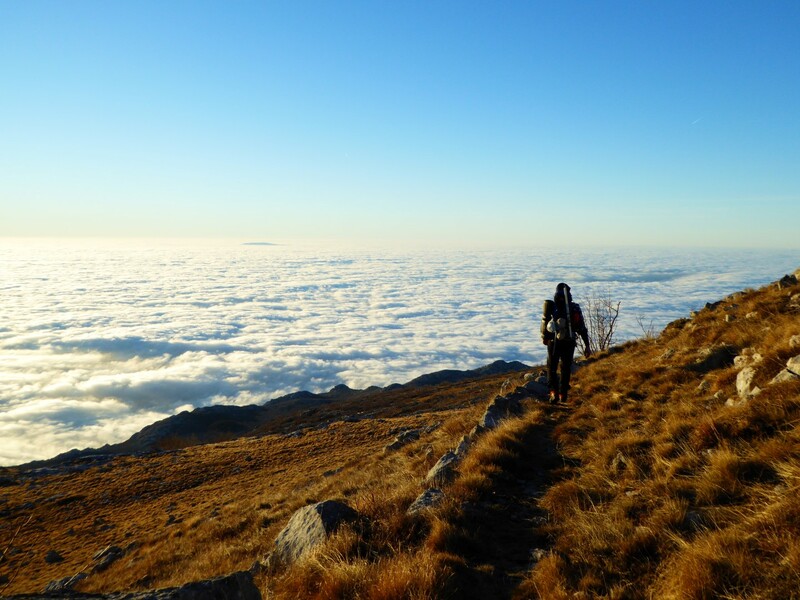 On our hike we will also have a chance to do an optional ascent to Veliki or Zavizanski Pivcevac (1676m), one of the highest peaks in the area of Northern Velebit. 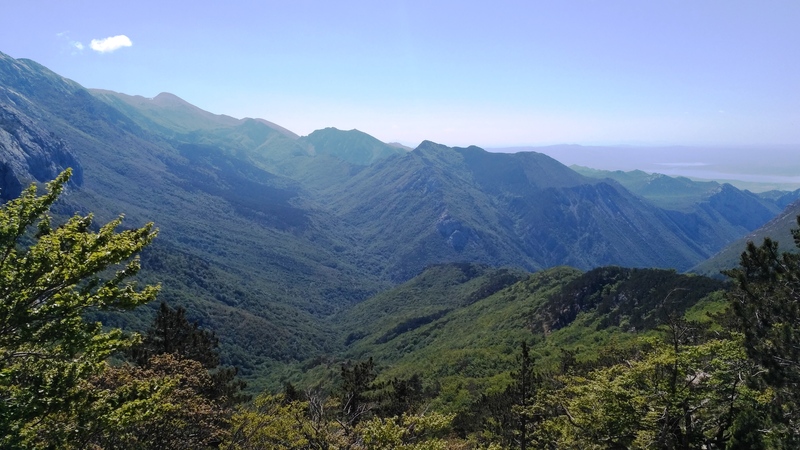 We end the day with a visit of the Velebit Botanical Garden and a drink on the lovely terrace of Zavizan mountain hut – the highest meterological station in Croatia and a hut with one of the most beautiful views in the entire Croatian Via Dinarica. 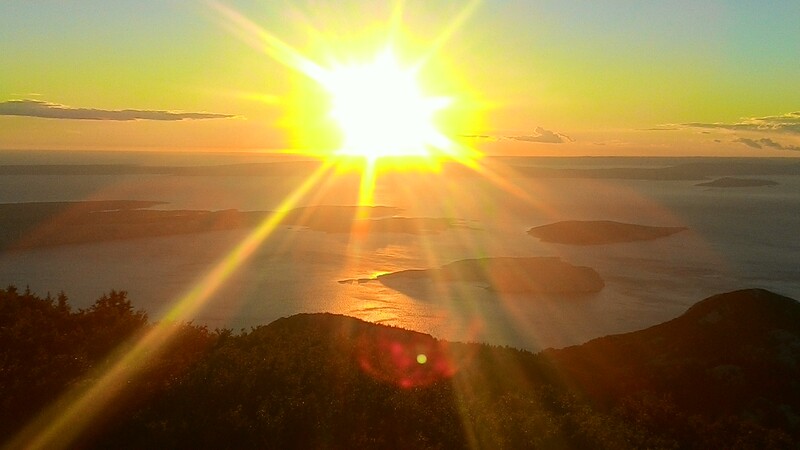 Enjoy the sight of Northern Adriatic Islands while having a beer on the terrace, 1.600m above. On a clear day, it is even possible to see all the way across the Mediteranean sea, to the Apenines of Italy and on rare occasions (who knows when is the next one?) even the mighty Dolomites. Dinner and overnight in Zavizan mountain hut. 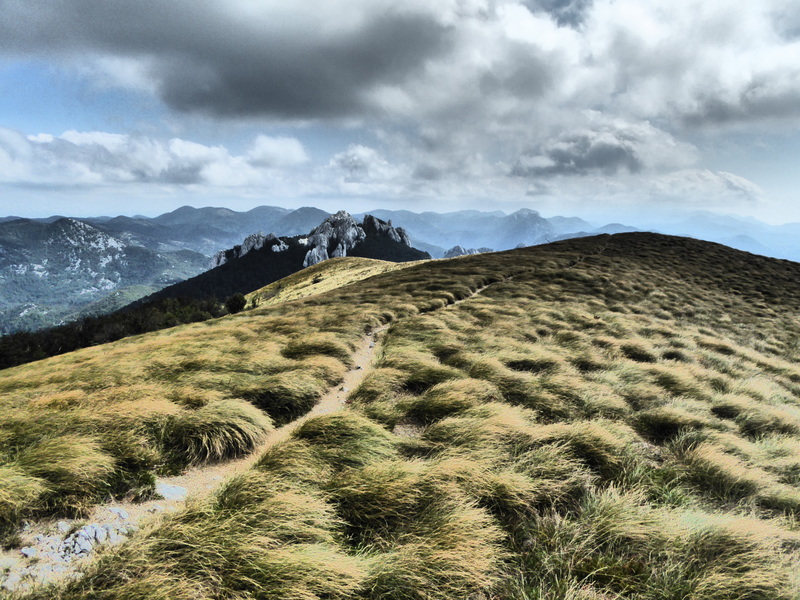 After ascending to Velebit mountain, today we start our walk on the Premuzic trail – a 57km long masterpiece of mountaineering architecture, following the main ridge of the mountain, in southeastern direction. 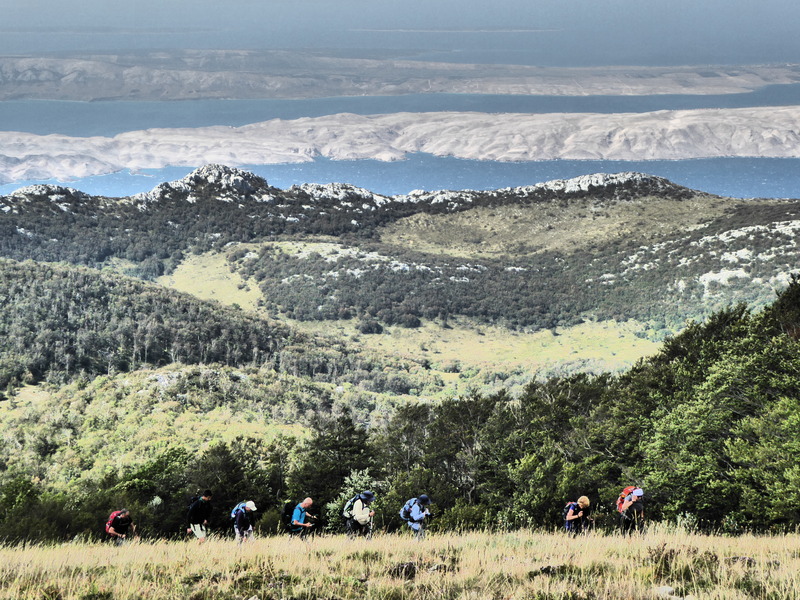 We will pass through the heart of the National Park Northern Velebit – one of the most wild areas of the mountain, that was opened to general outdoor public when the trail was built. We learn about the endemic flora and rich fauna of the area, while we hike through this limestone maze. 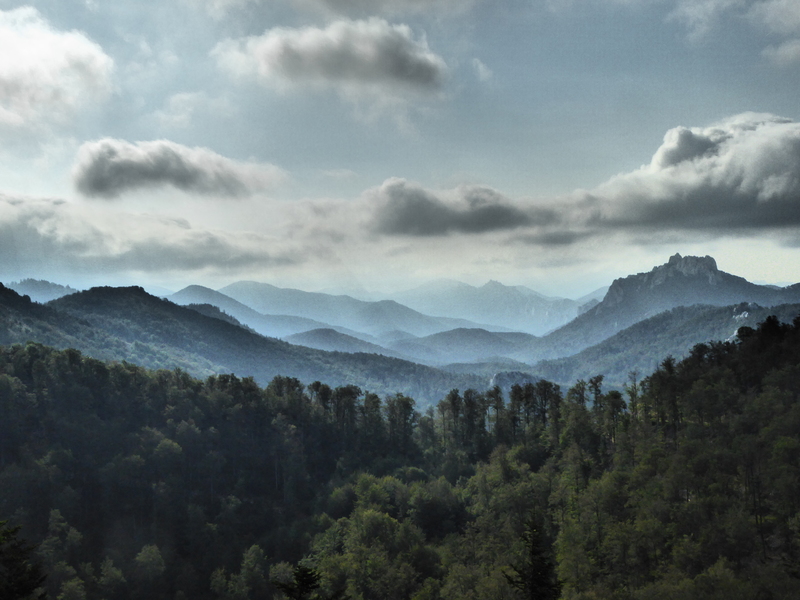 In the evening, we arrive to Alan mountain pass, where we spend a night in basic, but very nicely renovated old shepherd houses, giving us a sense of authentic Velebit. Dinner and overnight. We continue our walk on the Premuzic trail. 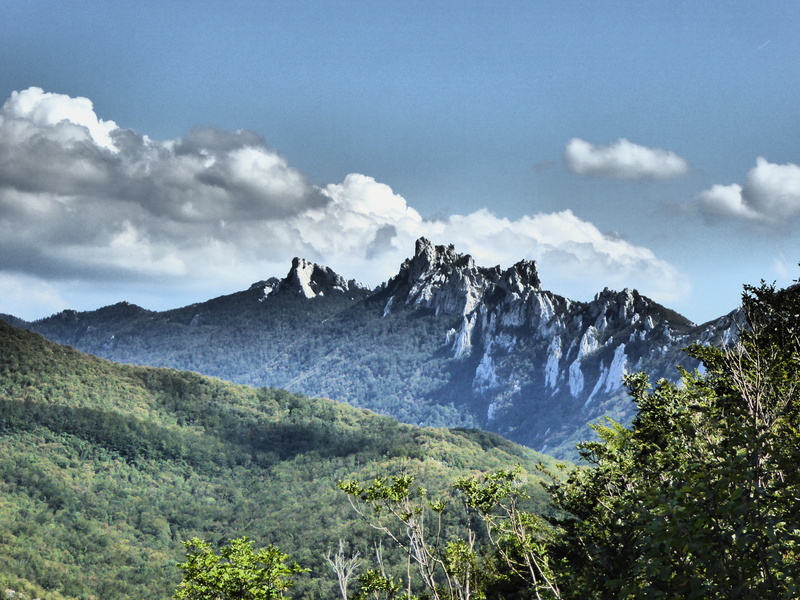 Today we discover the beauties of northern part of Central Velebit, hiking to the Kugina kuca mountain hut. 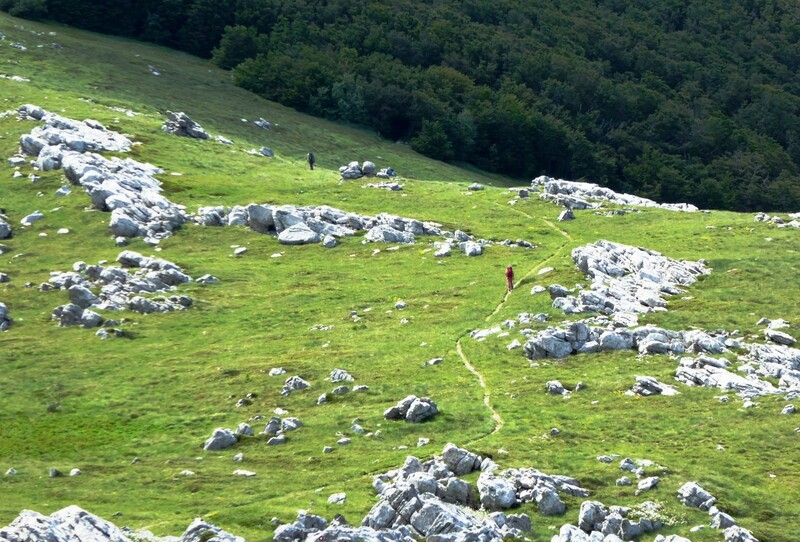 On the way, we will ascend the highest peak of Central Velebit – Šatorina peak (1622m). Views to inland Lika region as well as islands of Northern Dalmatia open up below us. Picnic on the way. Arrival to Kugina Kuća Hut and a short transfer to village Baske Ostarije in central Velebit. Dinner and overnight in a nice hostel ran by local community. 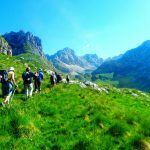 After a solid mountaineering breakfast we take a short transfer to the area of “Dabarski Kukovi” – a network of high limestone rock towers overlooking the green valleys of Central Velebit. 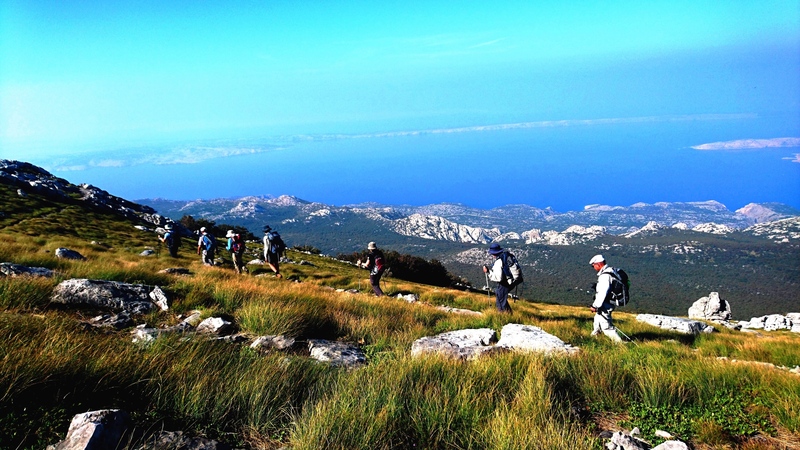 Circular hike around the area, with ascent to Visibaba peak (1160m), for beautiful views of Central Velebit and Northern Dalmatia islands below us. Descent to Ravni Dabar mountain hut, for a simple but very tasty “mountaineer lunch”. After lunch transfer to Starigrad Paklenica, a town situated on the Croatian Adriatic coast, just below National Park Paklenica, at the southern tip of Velebit mountain. 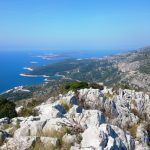 We will drive along the well-known „Adriatic magistrala“ – a scenic road that winds along the Croatian coast and offers many nice views on the bays and islands below and in front of us. Arrival to Starigrad Paklenica, accommodation in hotel, dinner and overnight. 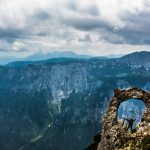 A circular hike in the National Park Paklenica. 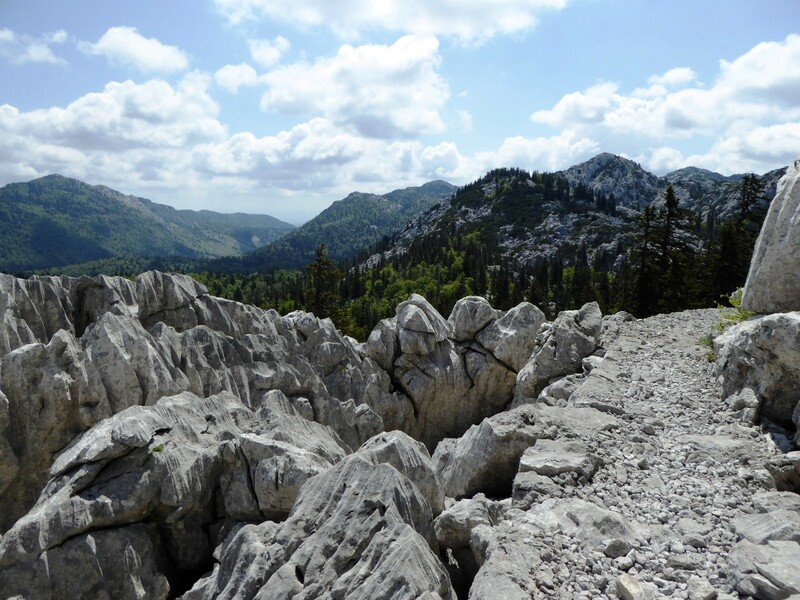 Unlike the Northern & Central Velebit, our today’s hike takes us to wide open areas with lower vegetation giving us an open view to rocky limestone towers („kukovi“) around us. We pass old villages, abandoned fields, drink freshwater from mountain streams and hike through the Velika Paklenica canyon – a beautiful karstic canyon carved by the creek of Velika Paklenica and its tributaries, running the rain water and snow melt from the highest peaks of Velebit mountain down to the Adriatic sea. Picnic on the way. In late afternoon, transfer to Trogir Old Town, a true Mediterranean gem, listed in UNESCO world heritage list. Dinner in the Old Town, tasting local Mediterranean cuisine and absorbing the antique spirit of this Greek founded city. In our quest for the ancient Greek Times we will also organize a small wine tasting, just as a glimpse of the beauties offered by the Dalmatian coast. Overnight in hotel. Depending on your departure time, possibility to explore Trogir Old Town, its stone cobbled streets and squares, palaces and the amazing Cathedral of St. Lawrence – a Roman Catholic triple-naved basilica and the most imposing monument in the city of Trogir. Transfer to Split airport and departure. NOTE: in case you are attending the next stage of the „Highlights of Via Dinarica“ – Croatia to Bosnia program – you will have an organized transfer to Split Old Town (UNESCO), where you will meet our tourleader and group for the next stage. 1 x night in Baske Ostarije (central Velebit), Hostel, multibedrooms & shared toilets / including showers with hot water! Our nature experts Zeljko Zarak, Mario Validzic and Evelin Balta will be your guides through the wonders of the Croatian national parks. Their love for pristine wilderness takes them often to hikes far away from the cities and crowds, where they can feel one with the nature. They will try to convey this special connection with nature to you and will make you feel as a part of the Croatian wilderness,while learning at the same time about local traditions, customs and old ways of life. Find out more about your guide here. 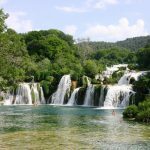 This tour takes you from the continental climate of Plitvice Lakes, over mountainous region of Velebit, through the sunny areas of Paklenica national park and the Mediterreanean climate of Trogir. So, 3 differente climates in just one week! Although our tours are ran in periods when the weather is usually stable, be sure to be ready for sun & snow! Warmer cloths for the mountains, but also a hat and sun glasses for the strong Adriatic sun.